Breeding performance in suburban and urban habitats appears to be poorer than in farmland. 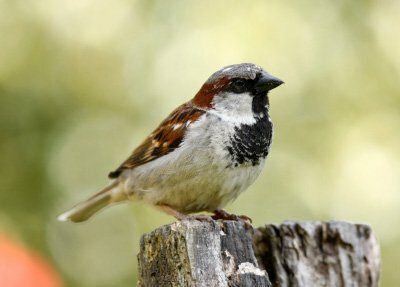 House Sparrows suffer greatest mortality during the breeding season, when adult birds appear to incur greater risks as they try to find food for their youngsters. With declining populations in suburban gardens, one might expect to see an increase in breeding success, as there is less competition for the available food. Not only is breeding success poor in suburban areas, there has also been no increase in that success in the past 20 years. Predation by cats and Sparrowhawks could be a factor affecting populations in suburban and urban situations, as cat ownership has risen and Sparrowhawks have colonised urban areas. Lack of nest sites has been proposed as a factor reducing the number of House Sparrows in our towns and villages. Although modern buildings contain fewer nest sites, House Sparrows will also nest in thick bushes. Food supplies in our towns and cities may have been reduced with the development of new buildings on previously derelict land. House Sparrows need aphids, weevils, grasshoppers and caterpillars to feed their young and these may now be harder to find in our towns and cities. An “individual” licence is granted by DEFRA to approved, named individuals, to tackle a specific problem, within a specific period of time, in an agreed manner. DEFRA assess applications on a case by case basis. Without a licence it is illegal to kill sparrows. Sparrows are protected by the Wildlife and Countryside Act 1981. Even if the birds are causing damage to property or other problems such as noise or odour they cannot be killed. Failure to comply with the 1981 Act can result in a fine of £5,000, a custodial sentence of 6 months, or both. If you suspect you have a sparrow problem, call us for more advice on 01992 763776.